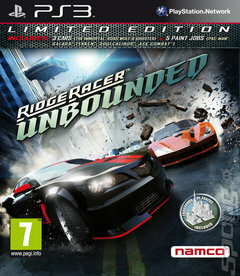 In quite a surprising change of pace for Namco Bandai, the Ridge Racer series is being jazzed up in Unbounded to focus on hi-octane explosions and smashing the snot out of your opponents. Theres no real HUD to speak of besides the Power bar and Position that sit in the corners of the screen - your score, lap information and other details are lettered across buildings and other structures in the distance in a pseudo-augmented reality style presentation. Gaining speed without hitting things will give you the best opportunity to overtake your rivals, but if you just focus on that then youre missing out on the key focus of the game - The Power. Using The Power, you can crash through pre-determined targets and access a shortcut to get ahead of the pack. Theres a good number of game modes to play with friends here, the main one being Dominate which pits up to 12 players against each other in a straightforward race. You can get ahead of the pack with efficient uses of the Power, which can be charged up by performing drifts and other stunts in order to plough through buildings and weak urban structures. Survival mode offers the same frantic gameplay, but does not allow a player to respawn once taken out. Drift Attack is a play for time, with seconds added to your clock by weaving around tight bends, and Frag Attack sees players commanding big rigs and smashing into cop cars for massive damage (and points). This, and the vast array of multiplayer modes, will ensure that Ridge Racer Unbounded at satisfies the many destructive tendencies of petrol heads the world over.